Williams, James Howard. Elephant Bill (A Panther book). We can help you find the elephants books you are looking for. As the world's largest independent marketplace for new, used and rare books, you always get the best in service and value when you buy from Biblio.com, and all of your purchases are backed by our return guarantee. London: Rupert Hart-Davis, 1953. Ninth Impression. With a Foreword by Field-Marshall Sir William Slim. Green cloth, gilt lettering on spine. B/w Frontispiece, Photographs. Drawings & Maps. pp.320 plus a B/w photo at the rear of the author with one of his nineteen dogs. Gift inscription on front pastedown. Contents clean, binding square and firm. . Reprint. Hard Cover. Very Good/No Jacket. 8vo - over 7¾" - 9¾" tall. Simon & Schuster. Very Good in Very Good- dust jacket. 1998. First Edition. Hardcover. Signed on title page by author. Long gift inscription on endpaper. Corner fold to the bottom front DJ flap. Couple of vertical scratches to the front of the DJ. ; 8vo 8" - 9" tall; 288 pages . London: Rupert Hart-Davis. 1953. Large octavo size [16x24cm approx]. Very Good in a Fair Dustjacket. DJ protected in our purpose-made plastic sleeve. DJ is chipped at corners and spine ends, with some discolouration. Book has some offset to free endpapers. Colour and black & white illustrations by Henry C. Pitz. Previous owner's details to front free end paper. 251pages. Williams was a British soldier who became an expert on elephants. This book is a follow up to his best-selling 'Elephant Bill'. . 1st Edition. Hardcover. Doubleday, 1950. Hardcover. Good Condition/Fair. 250 pages; photos. Light discoloring and wear; a sound binding; good overall. The jacket is heavily scuffed, worn and torn. "An affectionate account of the remarkable elephants who work in Burma's teak forests, by the man who spent 25 years directing elephants in peace and war. With 32 pages of photographs." Quantity Available: 1. Shipped Weight: Standard Weight. Category: Biography & Autobiography; Inventory No: 167856. .
Surry Hills, NSW: RD Press. 1992. Quarto Size [approx 24cm x 30.5cm]. Very Good condition in Very Good Dustjacket. DJ protected in our purpose-made plastic sleeve. Illustrated with colour photographs and colour & black & white drawings. 240 pages . 1st Edition (Australia). Hardback. Elephant Parade, Singapore, 2011. Edition Unstated. Hardcover (Laminated Illustrated Boards). Very Good Condition/No Dust Jacket. Illustrator: photographs. second-hand copy, no damage to describe, apart from a foxing mark on the half title page. no annotations, profusely illustrated with elephants that were offered by Sotheby's at Elephant Parade's first ever Asian installation and fundraising auction. Size: 8vo - over 7¾" - 9¾" tall. 262 pages. Illustrator: photographs. Quantity Available: 1. Category: Natural History & Resources; Elephants; Animals & Birds. ISBN: 9490725102. ISBN/EAN: 9789490725105. Inventory No: 0279649. . 9789490725105 This book weighs over 1 Kg packed and extra postal costs will be asked for when shipping outside Australia..
Mile End, SA: Wakefield Press. 2016. Octavo Size [approx 15.5 x 22.8cm]. Near Fine condition. Illustrated with Black and White Photographs. 196 pages Samorn, the Adelaide Zoo's last elephant, was adored by generations of zoo visitors. A gift from the Thai government in 1956, she survived until 1994. Elephants and Egotists is a tribute to Samorn, but also tells of other elephants sent to South Australia and the colourful characters who decided their fate. Provides insight into the vexed history of Zoos and elephants. . 1st Edition. Softcover. New York: Abrams, 2000. Hardcover. SIGNED. First printing. NEW/Fine in Fine dust jacket, mylar protected. An un-read copy. Small wrinkle at the back end paper. Publisher's promotional sticker to front dj. BOOKS SHIP THE NEXT BUSINESS DAY, WRAPPED IN PADDING, IN A BOX. A beautiful bird with sparkling colors and magical powers visits Babar's son, Alexander, in the middle of the night. SIGNED BY DE BRUNHOFF. 38 pages; 12.5 x 9 inches; color illustrations throughout. Halfway House: Southern Book Publishers, 1992. First edition. Hardcover. Fine in Near Fine DJ. Some chipping and scuffing to DJ.. 12mo (over 6 " - 7 " tall) in brown DJ; 150 p. : ill. ; 18 x 25 cm. African elephant -- Africa, Southern. Wildlife conservation -- Africa, Southern. Natural history -- Africa, Southern. Random House, 2000. 1st Edition. Hardcover. Fine/Fine. True first edition, very fine as new. Dust jacket has a Brodart cover. 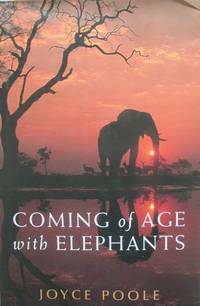 A comprehensive text on all elephants. Darling & Company, Seattle, 2004. First Edition. Softcover. Very Good Condition. Introduction and Picture credits. The text is illustrated with 30 illustrated postcards with an elephant theme. Illustrated front cover with green and white coloured titles to the front panel and blue and black colour titles to the back strip. As the title would suggest postcards with an elephant theme. 22 postcards celebrating the North and South poles with fabulous photography taken by Galen Rowell. A little rubbing of the book edges and to the book panels. Size: Landscape 12mo. Non-paginated.. Please refer to accompanying picture (s). Quantity Available: 1. Category: Art & Design; Postcards; Elephants; Animals & Birds. ISBN: 1595830537. ISBN/EAN: 9781595830531. Inventory No: 0124289. . 9781595830531 Post will be reduced to $7.90 for posting inside Australia, at the time of processing the order..
London: Elek, 1955. First edition. Hardcover. Some foxing and wear to exterior; boards oddly silverized (oxidized? ); in a VG- edge-worn DJ with a bit of tape reinforcement to DJ verso.. Octavo in color-illus DJ; 244 p. illus. 23 cm. Elephants, Indochina; Elephant hunting. // Translation of : Un quart de siècle parmi les éléphants. New York: John Wiley & Sons. 1991. Large Quarto Size [approx 24cm x 30.5cm]. Very Good condition in Very Good Dustjacket. DJ spijen a little sunned but clear & now protected in our purpose-made plastic sleeve. A nice copy. Illustrated with Colour photographs. 206 pages . 1st Edition. Hardback. Chronicle Books. Fine in Fine dust jacket. 1988. First Edition Thus. Hardcover. 087701521x . Hardcover. 1988. Chronicle Books. Owners inscription on endflap and price clipped, else Book and Dust Jacket are in FINE condition. ; 10.80 X 9.60 X 0.90 inches; 286 pages . Garden City, NY: Doubleday & Company, 1950. Hardcover, 250 pages. Good condition in a Fair dust jacket. Size 8.5"x5.5". "An informal study of the habits and accomplishments of the elephants that haul teak in Burma. Many elephants - the brave ones, the wise ones, the murderous ones, and the jokers - spring to life in these pages." Includes map endpapers, and b&w photo illustrations. Book has moderate handling/shelfwear. Spine is slightly cocked. Text is clean and unmarked. Dust jacket has chips, closed tears, and sunned spine; enclosed in mylar cover..
W. H. Allen, London, 1965. First Edition. Hardcover. Very Good Condition/Good. This fascinating chronicle of elephant hunting is by a man with adventure in his blood. He has been professional ivory hunter, coffee planter, and gold miner. He has encountered man-eating tigers and lions the latter once ate over a thousand people in thirteen years. He was Deputy Game Warden of Tanganyika, and took Prince Bernhard of the Netherlands on a hunting safari. He controlled what he considers to be the two best Game Reserves in the territory  Rungwa Reserve (where he found cave drawings), and Lake Rungwa Controlled Area with its marvellous bird life. It is one of the breeding grounds for flamingos and pelicans, with an abundance of hippo. Mr. Rushby is closely concerned with the technicalities (and sometimes the mystique) of elephant hunting. He knows a great deal about elephant behaviour, the training of hunters, the types of weapon to choose, and the dramatic superstitions surrounding the profession. He tells of the great hunters of the pastsome of whom pre-dated the earliest explorations in the territory, and at least two of whom are reputed to have reached Victoria Falls before Livingston. He is no sentimentalist. He gives the facts, knowledgeably and entertainingly, and his story makes a real contribution to the work of the Game Reserves. Book - in Very Good brown boards with gilt lettering - some bumping to the extreme top corner of the front board & extreme ends of the spine. Contents, some spotting/browning to the paste downs & to the rear free end paper, slight spotting to the free front end paper, some browning to the edge of pages 49, 65, 113, 127, 128/9, 159/163, 173/179 otherwise clean and tightly bound. Dust Jacket - Good - some wear & slight loss to the extreme edges and corners all repaired to verso. Also has publisher's review slip. Size: 8.75 inches tall by 5.5 inches. 205 pages. With 12 black and white pages of photographs. Quantity Available: 1. Shipped Weight: 201-750 grams. Category: Fishing & Hunting; Elephants; Pictures of this item not already displayed here available upon request. Inventory No: 8746..
Hardcover. 250 pp. Doubleday & Company, Inc., New York (1950). First Edition. Later Printing. Bright, clean, unmarked copy with minor edgewear to cloth boards. Appears mostly unread. Straight and square boards and corners. Softened spine ends. DJ has one tear at top front panel near spine, and moderate chipping at extremities. Near Fine/Very Good. More photos on request. Shipped in a box within a box, in bubble wrap, with a tracking number.